Scientific Name(s): Euphorbia obesa Hook. Photographer(s) Appreciation: Thank you to Dr. Lee Foote, director of the University of Alberta Botanic Garden for both the photograph and the write-up for today's entry! It is much appreciated to have a contribution as I continue to catch up! Perhaps this odd plant would have been an appropriate species to feature for April Fool’s Day, because it is full of trickery. Given it is held in a collection at the University of Alberta Botanic Garden, a common misidentification of this small succulent is to presume it is an indigenous cactus, but it is not. In appearance, it seems as if someone had left a baseball on the sand in our greenhouse’s succulent display. But then the baseball flowered! Even the flowers were a trick, though, because species of Euphorbia produce specialized bodies called cyathia or “false flowers” (the true flowers are hidden well within these structures). The trick to nature was that this flowering happened in March (in the greenhouse) where there were no insects for pollination. Oh yes, better get two of them if you want to produce offspring because the mischievous Euphorbia obesa is dioecious, with each plant sporting either male or female flowers. The globular form represents a low surface-to-volume ratio, thus holding moisture in the succulent plant body and therefore aiding the plant’s ability to weather extended droughts. Sinisterly, that moisture is unavailable to us as humans because the milky sap, called latex, is toxic. This toxicity is speculated to have evolved as an anti-herbivore defense mechanism against the abundant native grazers of the species’ South Africa origins. Ironically, many of those grazers are now extirpated or extinct. Toxic for nothing. Is anything as it seems with Euphorbia obesa? This euphorb is one of many occurring in the harsh desert conditions of South Africa’s coastal Cape Province. The wide diversity of isolated habitats provided abundant microclimates for species radiation over the Great Karoo and its many subregions over the last 100 million years. Adjacent to, but distinct from, the Euphorbia obesa range is the Fynbos region’s 8000 plant species occurring in a belt along the coast; of those plants, 6000 are endemics, making it more speciose than any South American rainforest. Many plants of the Karoo and Fynbos are cultivated in botanical collections where their active conservation contributes to maintaining genetic lineages as a hedge against extinction. A disproportionately large number of valuable medicinal and marketable compounds appear to exist in the Cape and coastal species, making their ongoing extinction a very practical loss of knowledge, human usefulness, and beauty. That is nothing to joke about. Thank you, Lee, for writing such an engaging and ‘woke’ write up on the euphorbia obesa. Given we’re in the 6th great extinction, I so appreciate botanical gardens and their custodial mandate. So much to mourn; it’s heartening to read a celebration of a plant. Wonderful write-up. I fell right into the cactus mindset upon seeing the photo, despite reading the genus name! Thank you. Are all botanists good writers? That was a very informative and entertaining read. As are these postings generally. Well thank you folks for the compliments and an enduring thanks to Daniel for keeping this site alive and active. We are all crazy for green-up at our latitude (55 degrees N) so we like to share the love of glass houses. Looks like a mini pin cushion with the pins all lined up evenly in rows or perhaps a Moroccan foot rest. I thought it looked as if it belonged in the parlor, at the foot of a comfortable armchair. I’d agree with Linda about the Moroccan footrest, except I’m pretty sure it’s covered in a Black-Watch pattern. I love Euphorbia’s, I have many in full bloom! 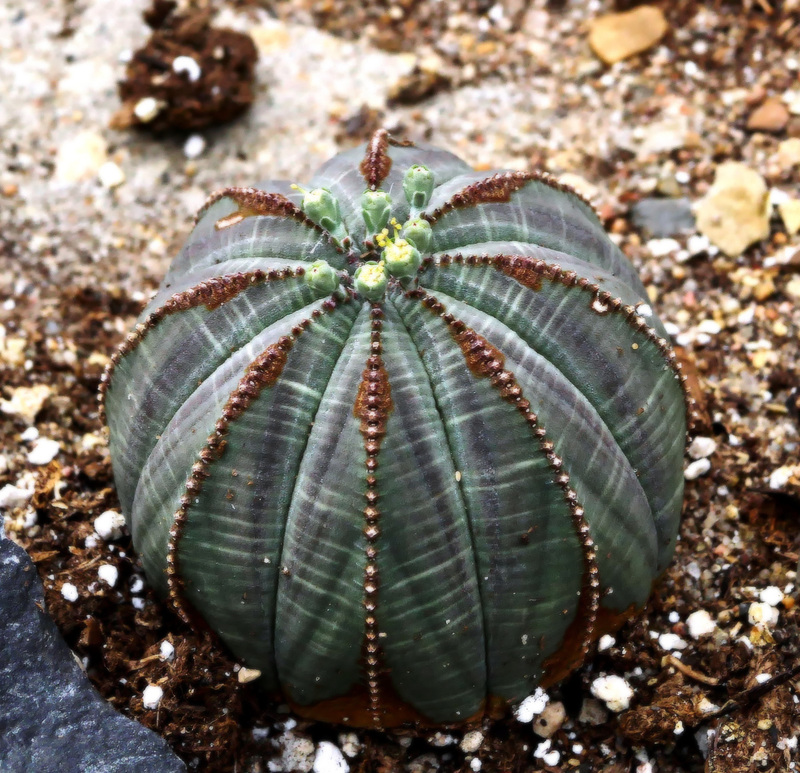 The Euphorbia obesa is fabulous! Thank you so much for the information. Another reason to go visit South Africa! Do the stems of all euphorbias have eight chambers? I am amazed that Euphorbias all belong to the same genus, despite the huge variations in morphology. Many are columnar, many are leafy and not succulent. That is just stunning! What a remarkable plant. Thank you for this post. What a beautiful thing, with the exquisite surface patterning! Great article ! An other trick is the dispersion of seeds. The small fruits are ejecting the spherical seeds so strongly that on a perfectly smooth house floor the seeds will roll to the walls or pieces of furniture. Euphorbias such as E. obesa can often be found in plant nurseries, flower shops, and even grocery stores. I have one in a small well-drained pot sitting on a window ledge facing west, for more than a dozen years. Bitter experience has taught me that E. obesa is very sensitive to overwatering, so I don’t water from September through April, then only gently start in May. Never allow water to stand in the saucer under the pot as the roots are very susceptible to rotting. Comparison with obese cacti is educational and a great example of parallel evolution of the vegetative morphology, but totally different (reproductive) flowering patterns and taxonomy. So strange! Commend you… Daniel for keeping us informed. Happy Birthday! Great read! Thank you, especially for writing about the risk of loss of so many endemics. I need to get a new one. Mine died several years back. I had it planted with a vertical/cylindrical Euphorbia (which lives on) that was roughly proportional to make them look like a baseball and bat. Now if I can only find a species that looks like a baseball glove. Sometimes known as the Tartan plant! A lot of research has been done recently on Euphorbiaceae including DNA tests with the result that the enormous genus still holds together and has swallowed a few satellite genera. The research was done by the PBI in conjunction with the University of Michigan and should be available on line. Are those ‘flowers’ atop Euphorbia obesa not unlike those among the red bracts of Euphorbia pulcherrima, our poinsettia? Certainly the two plants as a whole bare little similarity. Fascinating plant you have described, Daniel. Thank you. I saw the photo and laughed out loud. Obese indeed. But so much more… a Scottish sea urchin? Plants are endlessly entertaining! Is that a male plant?